If your CO2 cartridge does not have the appropriate valve for the self-filling process or if you wish to have a second cartridge, you can also order an appropriate carbon dioxide cylinder for the self-filing process as well. Suitable for all „Sodastream“ Devices. The cylinder becomes your property on purchase and cannot get part of the SodaStream deposit system. Therefore, a return is not possible. After 10 years, a TÜV-Test has to be made. Your gas dealer is authorized to carry out such a test. 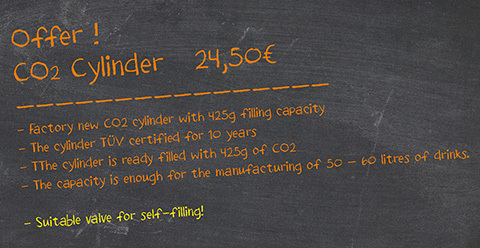 After this test, the cylinder can be used without any problems for additional 10 years until the next inspection.